Posted by thetickthatbitme in TBI Facts, Tick-Lit, Treatment. Oh no, not a Borrelia infection! This is part one in a multi-part series on vocabulary related to tick-borne infectious diseases (TBIDs). Today, we focus on symptoms. You can find all these terms and more on the Glossary page. arthralgia: a fancy medical term for joint pain. The origin is Greek (arthro- = joint; -algos = pain). Arthralgias may be a symptom of injury, infection, illness, or an allergic reaction. They are a common symptom with TBIDs like Borrelia burgdorferi (Lyme Disease), Borrelia hermsii (TBRF), and Babesia. myalgia: a fancy medical term for muscle aches. Myalgias can be a symptom of infection with Borrelia burgdorferi (Lyme Disease), Borrelia hermsii (TBRF), Babesia, Ehrlichia, Anaplasma phagocytophilum, Rocky Mountain Spotted Fever, Toxoplasmosis, Malaria, or Influenza. They can also be a symptom of inflammatory diseases like Multiple Sclerosis. Bell’s palsy: This is a paralysis of the muscles in the face caused by damage to the seventh cranial nerve. It is often unilateral (only on one side), and it’s more commonly seen in patients with Borrelia burgdorferi. As you may know, one of the consequences of Borrelia infection is inflammation, and this inflammation can lead to loss of nerve function. You can read more about Bell’s palsy here. Patients with Borrelia infections may also have damage to the eighth cranial nerve (also known as the auditory vestibular nerve), which can result in tinnitus (ringing of the ears) and problems with balance. A pulse oximeter measures pulse and oxygen. Image via Yale Medical Group. postural tachycardia: Tachycardia is a heart rate that exceeds the normal range (usually indicated by a pulse greater than 100). Some people with infections have tachycardia all the time, but many only have postural tachycardia, which is tachycardia when you stand up for 3 minutes after lying down for 3 minutes. According to my doctor, this has been a great predictor of whether a patient has an infection, and he puts every new patient though the “tilt test”: lie down three minutes, have your vitals taken, stand up 3 minutes, have your vitals taken. Often, the difference in lying and standing pulse will decrease over the course of treatment. herx: Herx is short for Herxheimer reaction (or Jarisch-Herxheimer reaction). It was named after dermatologists Adolf Jarisch and Karl Herxheimer in the late nineteenth century, who discovered it while treating Syphilis patients with mercury. (Fun fact: Herxheimer was a colleague of Paul Ehrlich, for whom Ehrlichia is named. They both helped found the University of Frankfurt. Not-so-fun fact: Herxheimer was murdered in 1942 by Nazis at Theresienstadt; he was 81.) A Herxheimer reaction can occur when one is being treated for an infection with antibiotics. It’s thought to be caused by the endotoxins that are released as bacteria start to die off. Herx are characterized by fever, chills, rigor (shaking), hypotension, headache, tachycardia, hyperventilation, vasodilation with flushing, myalgia (muscle pain), and exacerbation of skin lesions. I’ve discovered a bit of an inconsistency when it comes to information available online and in published research about herx. Almost every Lyme patient blog I’ve ever read mentions herxing. I was herxing bad today, etc. Many patient and doctor organizations related to the treatment of Lyme Disease also discuss herxing. They characterize herxing as common among patients with Borrelia infections and as a sign that antibiotics are working. Herx seems to be used liberally as a term that means any sort of increased discomfort that a patient feels while undergoing antibiotic treatment. For the sake of comparison, let me tell you how a medical textbook describes the Herxheimer reaction. I’m using as my reference Principles and Practices of Infectious Diseases, seventh edition (borrowed, not bought). I’ll start with the Herxheimer reaction as studied in patients with Borrelia hermsii (TBRF) infections. A herx in hermsii patients is characterized by severe rigors, increase in temperature, and decrease in blood pressure. The onset of reaction occurs within 2 hours of initial therapy and coincides with clearing of spirochetes from the blood. This means that in order to have the reaction you have to have spirochetes in the blood (which would be indicated by a positive blood smear). You’ll also notice that the reaction happens on the first day of treatment. According to Principles and Practices, herx occur in 30-40% of patients with Borrelia hermsii infections. When a herx does occur, medical attention is necessary because there is a possibility of fatality. Aspirin is sometimes given to lower the fever. A saline infusion can be given to increase blood pressure. If the reaction is very severe, the patient may have to be given steroids. In sum, if you have an acute Borrelia hermsii infection and are treated with antibiotics, there is a chance that you will have a herx reaction the first day of treatment. If you are having a true herx, you will probably need immediate medical attention. Now, you may remember that I had Borrelia hermsii, and upon reading the above information, I was really curious as to why I never experienced one of these reactions. When I asked my doctor about it, he explained that it was because I had a latent infection. In other words, I did not receive treatment until several years after I was infected. My body had already tried to fight off the bacteria, and had partially succeeded because my infection was no longer acute. This meant I did not have a high load of bacteria in my blood. So even though some days my joint and muscle pain worsened and I felt sick to my stomach, because I didn’t have the shaking, the fever, and the low blood pressure and because the bacteria was hiding in my joints, not in my blood, I never had a herx reaction. Dr. W went on to say that he has treated more than 50 people with B. hermsii infections, and he has never seen a herx in clinic. He has, however, seen some fever-chill reactions when patients with hermsii were being treated with Ceftriaxone. “And those weren’t herx?” I asked. He didn’t believe so; rather, he thought that the fever and chills were because Ceftriaxone wasn’t killing the bacteria quickly enough. When he switched those patients to Ertapenem, a stronger antibiotic, the fever and chills went away, and the patients saw improvement in their conditions. Now here’s what Principles and Practices has to say about herx in patients with Borrelia burgdorferi (Lyme Disease). The reaction occurs during the first 24 hours of therapy, and consists of high fever, a redder rash, and greater pain. Some vasodilatation may also occur. The Herxheimer reaction occurred in approximately 15% of patients. Only 15 percent! That was shocking to read. There were also no reported deaths from Herxheimer reactions during antibiotic therapy for Lyme Disease. Clearly, the rate of herx reactions in studies did not match my impression from anecdotal accounts from patients, so I asked Dr. W if he could offer any explanation. His hypothesis was that since most B. burgdorferi (Lyme) patients have latent (long-term) infections and not acute (new) infections, they are probably not having true herx reactions. However, since some doctors prescribe a lot of different supplements to be taken while patients are undergoing antibiotic therapy, perhaps some of the symptoms that patients feel are adverse reactions to the supplements. Because supplements are not subject to the same FDA regulation as pharmaceuticals, the companies that manufacture them are not required to prove their safety or effectiveness. Consequently, very little is known about how these products interact with prescription and over-the-counter medications. To read more about supplements and regulation, go here. Herxheimer reaction is a medical term used to describe a specific set of symptoms in a specific set of patients (those with acute Borrelia infections) which may be life threatening (in the case of very high fever and very low blood pressure), particularly in patients with Borrelia hermsii infections. The term “herx” has been adopted by both the LLMD (Lyme-literate medical doctor) community and the Lyme patient community and has evolved into a generic, non-clinical term that means discomfort or worsening of symptoms that occurs multiple times throughout the course of antibiotic treatment. 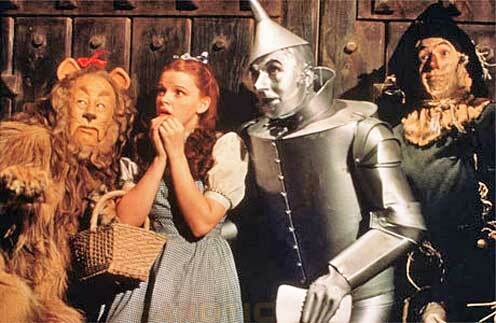 Just because a patient is experiencing discomfort does not mean he or she is having a true Herxheimer reaction. Contrary to what some doctors say, there is nothing worrisome about a patient who does not have a Herxheimer reaction, as they only occur in 30-40% of B. hermsii patients and 15% of B. burgdorferi patients. Some episodes of high fever and chills during antibiotic therapy might mean that the antibiotic is NOT working well enough. Patients sometimes benefit by being switched from Ceftriaxone to Ertapenem. Because some patients take a number of supplements in addition to antibiotic therapy and none of these are properly regulated by the FDA and studied in clinical trials, their effect on the body is unpredictable. It’s possible that some reactions that patients believe are Herxheimer reactions are actually reactions to other things they are taking. Posted by thetickthatbitme in Treatment, Whole Person. As you might have noticed, I am quite the internet researcher these days. I’ve been googling around, reading about different people’s experiences with IV therapy, and I have to say, some of the things I’ve seen are downright horrifying to me. To make sense of it all, I started researching the different ways that people can be hooked up to IVs and thinking about this in the context of my own experiences being poked with needles. I admit, I couldn’t figure it all out by myself, so yesterday, I requested an interview with Dr. W and he explained some of the nuances of IV practices to me. The following is my layman’s term translation of what I found out. There are four main ways to do IV antibiotic therapy, and some methods are more popular than others. I’ll describe a little about each one, and then we’ll compare. 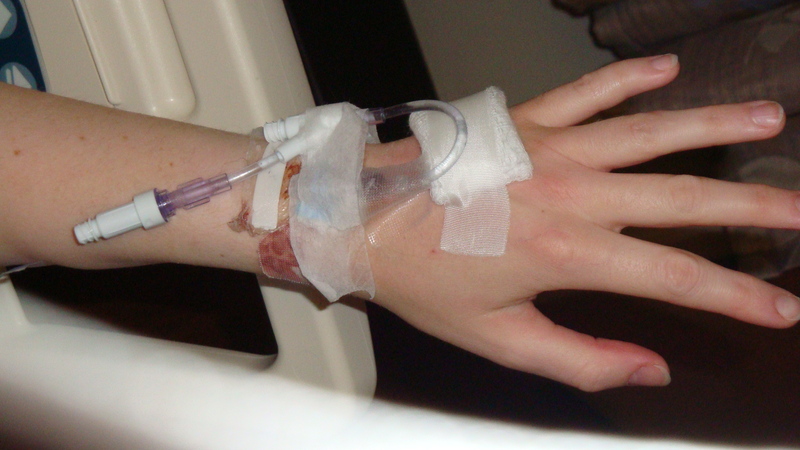 Here’s my hand with a catheter in it following spine surgery in 2010. I think they took it out shortly after this because it was getting kind of gross. One method of IV therapy is to insert a catheter into a vein in the hand or arm. 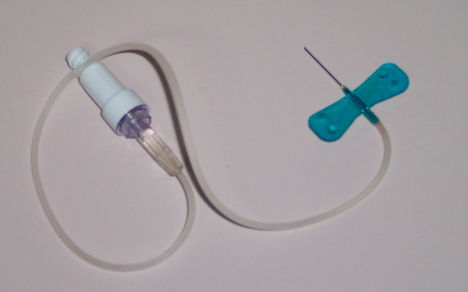 The catheter can then be connected to a bag containing the prepared antibiotic. (If you’ve ever had general anesthesia, you’re probably familiar with this one.) Catheters can be left in up to three days, but after that, they need to be removed to avoid infection. When a catheter is taken out, another one cannot be put back right away in the same place, as this can damage the vein. One problem this poses is that a doctor treating a patient with IV therapy for an extended period of time may run out of places to put the catheter. Having a catheter can also inhibit a patient’s normal activities (like bathing, for example). 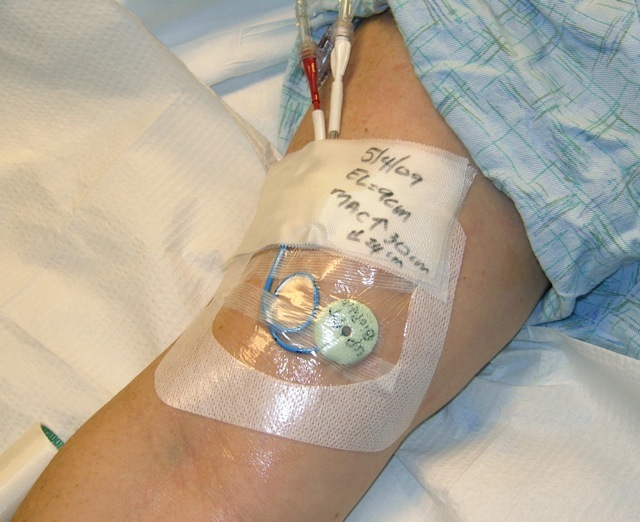 A PICC line (PICC stands for peripherally inserted central catheter) is inserted into the cephalic vein in the arm, which runs up into the subclavian vein. This line can be left in the vein for weeks at a time, so it is often used for long-term antibiotic treatment because it is more convenient (for the doctor) than inserting a catheter every 3 days. On the downside, having a PICC line inserted can cost thousands of dollars and may or may not be covered by insurance. The dressing needs to be changed weekly by a nurse, which is another added expense. If any complications arise, this may mean time spent in the hospital emergency room. One patient I know who was getting treated with vancomycin through a PICC line (for a non-tick-borne infection; vancomycin can only be done through a PICC line because of the nature of the drug) developed a severe allergic reaction to the adhesive that was used to tape the line. It looked like she had burns on her arm! Other people develop serious infections. How common is infection with PICC lines? In a study of 200 patients being treated with antibiotic therapy via PICC line, 15 patients had complications related to the PICC line itself, and six suspected line infections were reported. Now, I don’t know about you, but I wouldn’t want to be one of those six people, especially if I were paying thousands of dollars out-of-pocket for this treatment. So why do doctors who treat TBIDs like to use PICC lines? A PICC line usually means that a patient only needs to be seen by the doctor every week or so, so it is certainly less work for the doctor. In between doctor visits, a nurse is supposed to assist the patient with administering the medication. I’ve seen a lot of patient testimonials online, however, that indicate that in between doctor visits, patients are basically left to their own devices. I shudder to think of what happens to these patients if they have adverse reactions to the antibiotics or if they contaminate their lines while administering their own treatments. This method is not very common with IV antibiotic treatment, but it does exist, so I am mentioning it. A portacath is surgically inserted under the skin into the subclavian vein (which is a big vein) in the upper chest or the arm. The port has a silicone bubble called a septum, where the needle is inserted to administer the drug. The risk of infection with a portacath is purportedly lower than with a PICC line or catheter. The downside would be having to undergo the surgery to implant the port, as well as the surgery to remove it. Though it’s considered a minor surgery, I’m sure it’s not cheap, especially if it’s not deemed medically necessary by your insurance company. This is the method with which I am most familiar, as it is how I was treated for 42 days. My doctor used a 23 gauge butterfly needle (which is an itty-bitty needle originally designed to be used in babies’ heads) and inserted it into a vein on the back of my hand. The needle was connected by a line to a bag containing the antibiotic, which was prepared fresh daily in a sterile hood. I sat in a comfy chair in the doctor’s office for about 45 minutes each day with the itty-bitty needle in my hand. This method has several advantages. First, I didn’t have to worry about purchasing and storing the drug or any equipment. Everything was provided at my doctor’s office and included in the cost of my visit. I also didn’t have to worry about ‘doing it wrong’ because the doctor did all the work. All I had to do was keep my hand relatively still for 45 minutes. Aside from this time spent in the clinic, this drug delivery method didn’t inhibit my activities because I wasn’t walking around with a needle stuck in my vein. I could shower normally. I could go to the swimming pool. I could wear long-sleeved shirts and jewelry. I also didn’t get a scar like I did from the catheter in my hand after my back surgery. For comparison’s sake, I was curious about the risk of infection with the needle-in-hand method, so I asked Dr. W about it yesterday. He said that in the past year at his clinic, he has inserted more than 4,000 needles for IV infusions, and there have been zero infections. 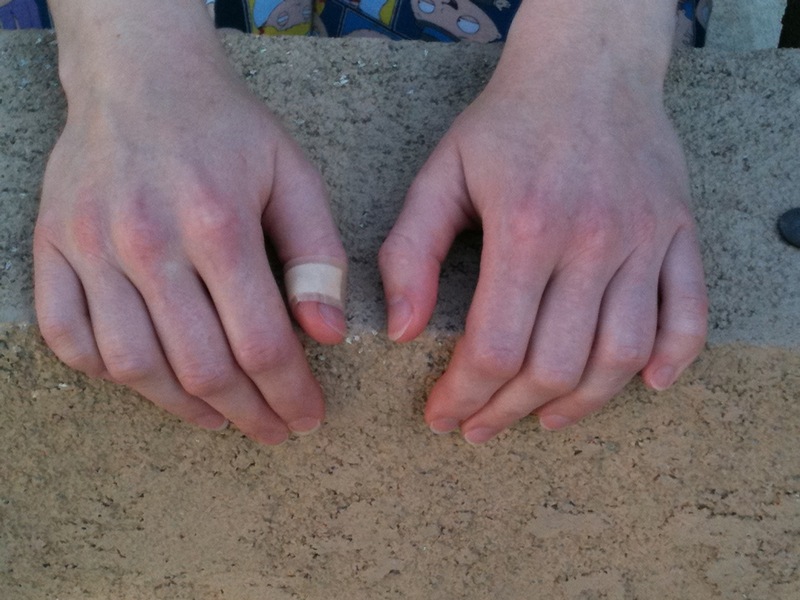 Can you tell which hand got stuck 40 days in a row? Okay, so let’s recap the pros and cons of each method.